Where Can I See My Gameshow's Reports? After you've run a Gameshow, click on the Reports tab at the top of the page. 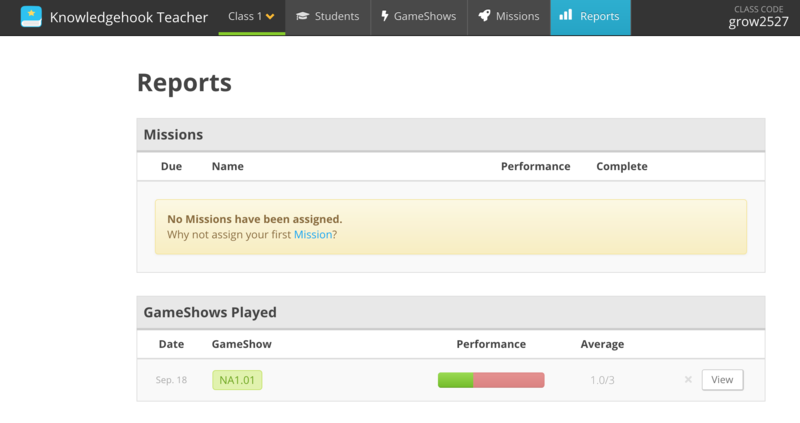 This reports page will show you all your Missions and Gameshows and allow you to see basics stats for the Gameshow (average score) and click the view button to see the results in detail. Clicking the View button for the Gameshow you want to check out will bring you to a report page where you can see the aggregated results for each question, breakdowns of individual student results, a button to download the raw results as an Excel file and a button to run a growth report. For the individual students results, we've anonymized the names of students for privacy but you can reveal them by simply clicking the eyeball icon of one of the students. Lastly, if you click any of the individual checkmarks or X's in a student line, it will bring up that student's attempt at the question!